OK well iv seen it done to a 5th gen but im not to sure if it can be done a fourth. Because im not good at this stuff at all i figured id ask, has anyone done this before and got any results. 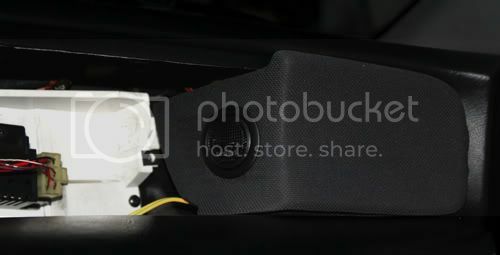 I have some pictures of the inside of the 4th Gen Cluster. I'll post those in a bit as well as recomendations for wirring. That link pretty much has the info you need tho. ok great. thankyou. How about anyone else? i see this tread has had quite a few views thus far. well, My memory must be failing me... I thought there was more room. You can still do it, just be sure to get the smallest LED strips you can find. *Hint: Search for "SMD Flexible LED Strips"
Then get creative on your install. 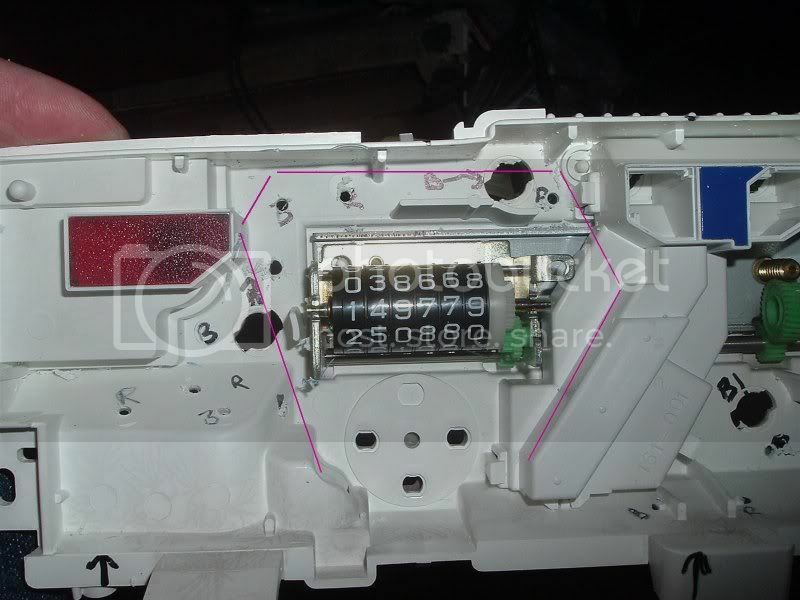 The pink lines are about where you need to install the lights to get adequate coverage. IMO you will need to cut the strips into segments of 3 and solder jumper wires to each "set." Last edited by LilMsPrelude; 12-06-2010 at 08:37 PM. ok kool. 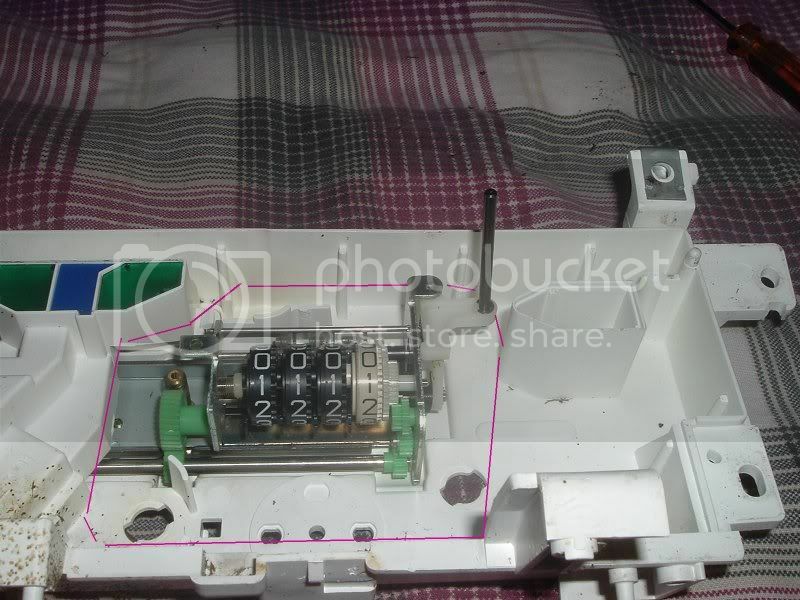 any idea of how to wire it up so i can control the lights with the stock controls? Just like the other thread, solder into one of the "stock" light terminal on the flexible circuit trace. That is the easiest way anyways. Do the tach side on one and the speedo side in another. Here's a picture from my setup for those who'd like to do this mod... I found that two 30cm SMD LED strips fit in nicely without needing to cut them in smaller pieces and the light distribution is good. that is cool. Did you use blue LEDs? Did you use blue LEDs? show me you dash! i demand it! pictures NOW!!! I don't have the cluster in the car at the moment, trying to figure out how to make the needles light up better.. as you can see from the picture it's quite hard to drive in the night like that.. 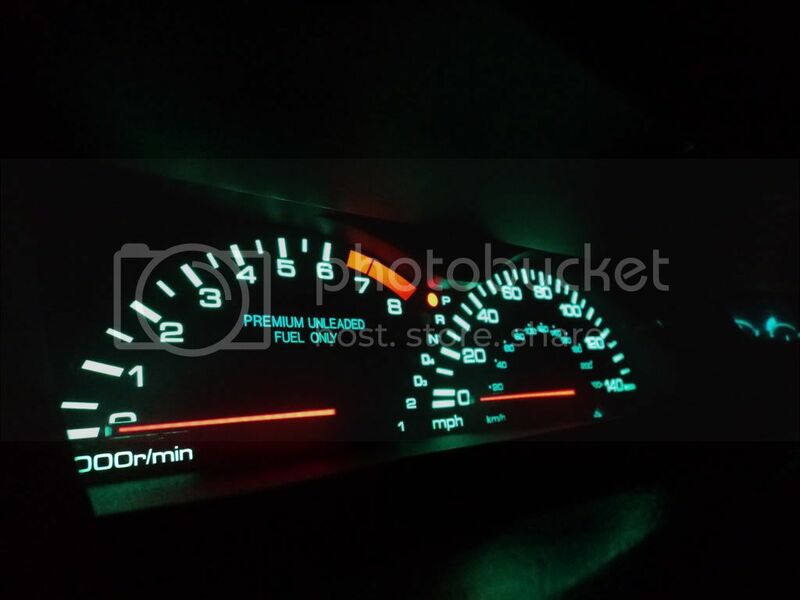 I'm actually trying to find some EL gauges for sale at the moment. Will make them blue too, of course . Here's the blueish fuel/temp gauge. The clock's also colored the same way, didn't just fit in this pic. auto gauge looks nice. how much did you pay for that? and is green the color you wanted? I got the el cluster, invertor, dimmer, and uncut dash harness...the center console and ebrake handle for 90bux out the door. Not counting how many freakin' screws, bulbs and emblems I had in my pockets. I didn't care what color it was since I intend on sanding the back of the gauges and doing a custom color for the whole dash. 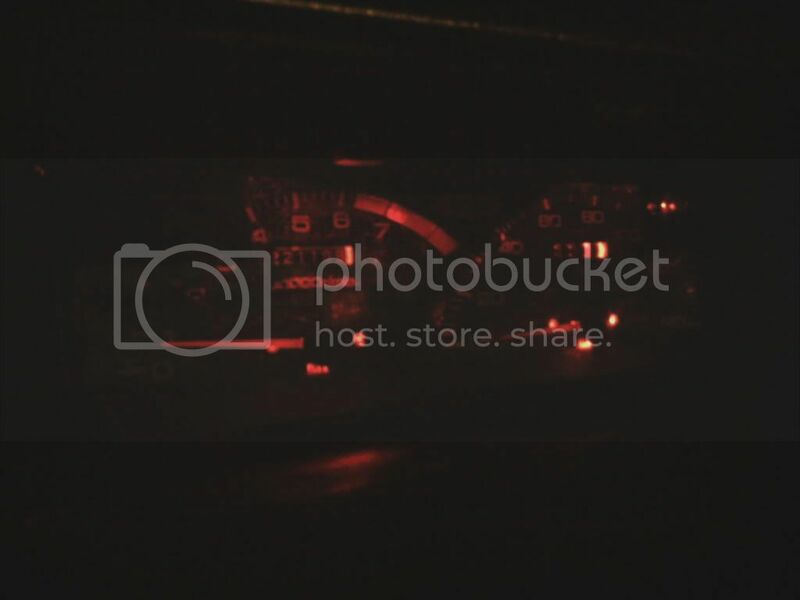 Last edited by jimmyznutz; 03-04-2011 at 10:31 PM. 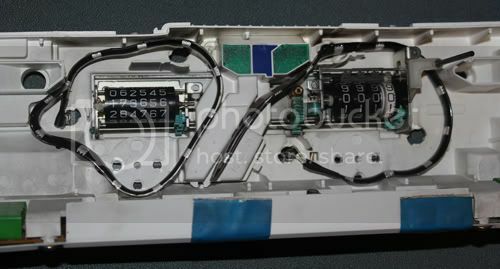 Which wires do you connect the LED strips to? Is it the same for 5th gen? it is the same thing actully, and i didnt connect them to wires. I just to one wire fron each side of the stripp and connected them under the copper pins on the bulb housing. looks hella fresh. Is that an EL or LED mod?? I have no idea, came in the car, can't really come across another one though.It's entirely digital though, you can't see the speedometer when the car is off. it appears to be an EL. Is this out of a vtec model?? nope, 94 si body, only thing that was swapped was the motor. ALRIGHT THESE LOOK WAYY TOO NICE! 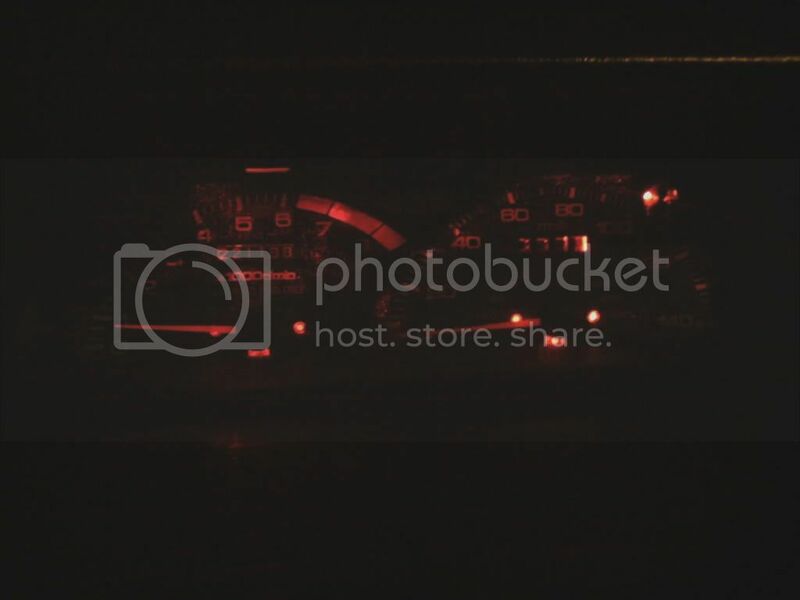 my lights on my dash are NOWHERE near bright as these, someone please tell me how to do it? step by step, please & thanks! theres no H in it lol but do you have the EL gauges? like the ones in post 16? Need help! I got a 96 elude and I want my whole dash to have blue LED any one know where I can find some or how tool make some?